The Tuesday bird walk went to the Plummer Road side of the Englishman River in Parksville. The morning was sunny with a strong wind off the Strait of Georgia. Two birders saw four Killer Whales at about 9:00 a.m. from Shorewood Drive close to the mud flats in San Pariel. They spotted one large adult and three smaller whales about half way across the strait. A Savannah Sparrow, Song Sparrows, a Lincoln’s Sparrow, a White-crowned Sparrow, several House Finch and Purple Finch were seen at the start of the walk. 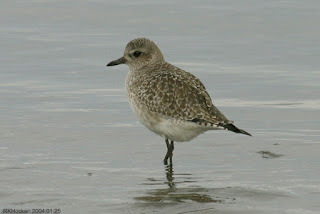 A Black-bellied Plover, two Least Sandpipers, two Western Sandpipers and three Killdeer were feeding on the mud flats. A flock of American Wigeons, Surf Scoters, Horned Grebe, one Red-necked Grebe, several Harlequin Duck, two Common Loons and three Pacific Loons were spotted on the strait. Northern Pygmy Owl: Photo by John Purves. The Tuesday bird walk on October 04, 2016 will be going to Columbia Beach. Meet at the Parksville Community Park at the parking lot near the Lions Club Kids Playground at 9:00 a.m. or at the parking area on Admiral Tryon Bld. off Columbia Drive in French Creek at about 9:15 a.m.
Hermit Thrush was seen and heard in a bush close to the trail. American Pipit’s were seen at Pipers Lagoon in Nanaimo. Two Pileated Woodpeckers are visiting feeders in the 800 block of Douglas Street in Nanaimo. A Trumpeter Swan was seen at the Deep Bay Harbour today. Trumpeter Swan: John Caddy photo. Wednesday, September 21: A White-throated Sparrow was seen just off of Owl Place in Long Lake Heights in Nanaimo. The morning started out with rain showers, but it soon cleared and the sun shone, brightly. The winds were calm on the Strait of Georgia. A large flock of Cedar Waxwings and American Robins greeted us at the start of the walk. 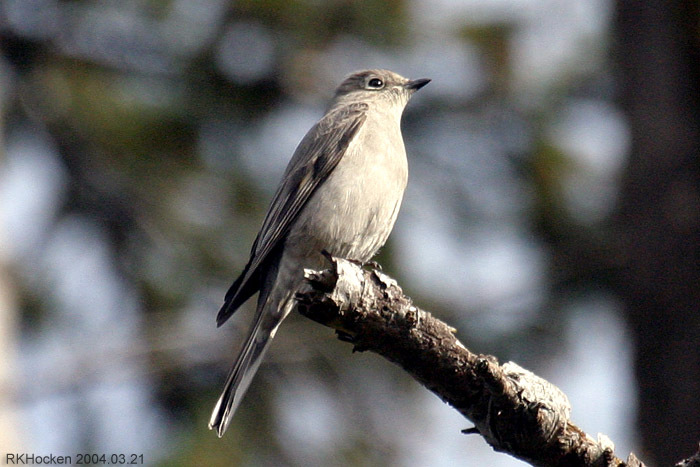 We spotted a Townsend’s Solitaire perched high up in a tall conifer tree. Two Ring-billed Gulls, several Bonaparte's Gulls, Mew Gulls, California Gulls, Glaucous-winged Gulls and one lone Thayer’s Gull were preening near the shore. Horned Grebes, Red-necked Grebes, Western Grebes and a Pacific Loon in breeding plumage were seen further offshore. We were entertained by a Townsend’s Warbler, a large number of Orange-crowned Warblers and several Yellow-rumped Warblers in the forest. Many flocks of American Robins were seen through out the morning. A very large flock of Canada Geese flew high overhead heading south. Eleven Turkey Vultures were seen along the shore at Pipers Lagoon in Nanaimo. The Sunday bird walk on October 02, 2016 will be going to Rathtrevor Beach Provincial Park in Parksville. Meet at the Birdstore at 9:00 a.m. or at the main parking lot at Rathtrevor Park at about 9:30 a.m. The Tuesday bird walk on September 27, 2016 will be going to the Plummer Road side of the Englishman River in Parksville. Meet at the Parksville Community Park at the parking lot near the Lions Club Kids Playground at 9:00 a.m. or at the corner of Plummer Road and Shorewood Drive at about 9:10 a.m. The Sunday bird walk went to Nanaimo River Estuary in south Nanaimo. The morning was sunny with calm winds. We spotted a Western Meadowlark perched on a bush on the estuary. Common Ravens were seen overhead all morning. A Red-tailed Hawk was constantly being mobbed by the Common Ravens before catching a thermal and leaving the area. We watched an Osprey, with a big fish in it’s talons, being mobbed by a Common Raven at the end of the walk. Sandhill Cranes were seen above the Englishman River in Parksville. A flock of Sandhill Cranes were seen over Mount Washington. The Tuesday Birdwalk went to the Little Qualicum River Estuary in north Qualicum Beach. the morning was sunny with calm winds. Many Surf Scoters, a White-winged Scoter, a Black Scoter, Horned Grebes and Red-necked Grebes were seen from the viewing platform. Killdeer were seen throughout the morning. We watched a Peregrine Falcon lift a flock of Gulls off the gravel bar and then catch a thermal and fly away. 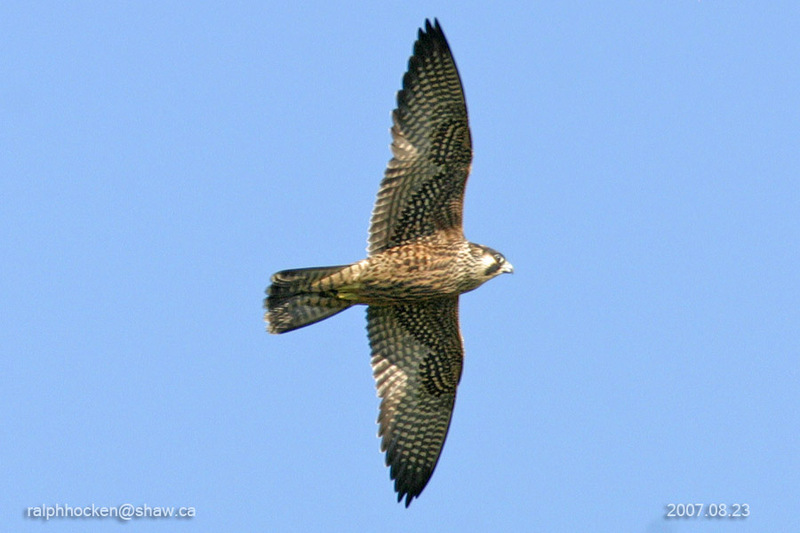 We spotted another Peregrine Falcon perched near the top of a tall conifer tree, giving us great views. A Cooper’s Hawk was perched in a tall snag on the estuary. A Merlin was seen catching a Barn Swallow high over the estuary. A Horned Lark was seen on Sugar Loaf Mountain.
. Fifteen American Pipits were seen at Piper’s Lagoon in Nanaimo. Twelve Orange-crowned Warblers were seen at Diver’s Lake in Nanaimo. The Sunday bird walk on September 25, 2016 will be going to Buttertubs Marsh in Nanaimo. Meet at the Birdstore at 9:00 a.m. or at the parking lot off Jingle Pot Road at Buttertubs at about 9:20 a.m. The Tuesday Birdwalk on September 20, 2016 will be going to Rathtrevor Beach Provincial Park in Parksville. Meet at the Parksville Community Park parking lot near the Lions Club Playground at 9:00 a.m. or at the main parking lot at Rathtrevor Park at about 9:10 a.m. The Tuesday birdwalk went to the Little Qualicum River Estuary in north Qualicum Beach. The morning was sunny with calm winds. A large number of Surf Scoters, a White-winged Scoter, a Black Scoter, Horned Grebes and Red-necked Grebes were seen from the viewing platform. The winter seabird colony are returning! Killdeer were numerous throughout the morning. We watched a Peregrine Falcon swoop down and lift a flock of Gulls off of the gravel bar and then catch a thermal and fly away. We spotted another Peregrine Falcon perched near the top of a tall conifer tree, giving us great views. A Cooper’s Hawk was perched in a tall snag on the estuary. We watched as a Merlin caught a Barn Swallow high over the estuary. The Sunday bird walk went to Buttertubs West in Nanaimo. The morning was sunny with strong winds. We had an excellent talk and demonstration by Eric Demers and the VIU banders on the banding of birds and the environment of Buttertubs West. We watched in fascination as Eric banded and measured each of the following species--- Common Yellowthroat, Bewick’s Wren, Lincoln’s Sparrow, Golden-crowned Sparrow, Savannah Sparrow and a Swainson’s Thrush. American Pipits, a Baird’s Sandpiper and a Whimbrel were seen at the Englishman River Mud flats in Parksville. 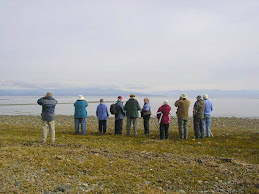 The first Tuesday bird walk of the season went to the Shelly Road side of the Englishman River Estuary in Parksville. The morning was mostly cloudy with calm winds. We spotted a family of Brown Creepers moving up the trunk of a tall Big Leaf Maple Tree at the start of the walk. The seabirds are beginning to arrive for the winter----Surf Scoters, Common Loons, Horned Grebes, Red-necked Grebes, Pelagic Cormorants Common Murre and a Marbled Murrelet were all seen on the Strait of Georgia. A Barn Swallow, a Purple Martin, a Vaux’s Swift and a Black Swift were seen overhead. A Yellow Warbler, several Orange-crowned Warblers, a Wilson’s Warbler, a Common Yellowthroat, a Warbling Vireo, a Willow Flycatcher and a Lincoln's Sparrow was seen near the end of a great walk. The Sunday bird walk on September 18, 2016 will be going to the Nanaimo River Estuary in south Nanaimo. Meet at the Birdstore at 9:00 a.m. or at the end of Raines Road at about 9:30 a.m. The Tuesday bird walk on September 13, 2016 will be going to the Little Qualicum River Estuary in Qualicum Beach. Meet at the Parksville Community Park at the parking lot near the Lions Club playground at 9:00 a.m. in Parksville, or at the Brant Viewing Platform in north Qualicum Beach at about 9:20 a.m.
For more information on VIU Banding check this site https://wordpress.viu.ca/gooseproject/.